In the last two weeks, we have flown from Japan to Taiwan, Taiwan to Hong Kong, and Hong Kong to Thailand. My head spins amidst these Asian cultures, searching for commonalities but settling on the current prevailing notion that no garden variety Asian culture exists. So Japan stands in contrast to Taiwan, and Taiwan differs from Hong Kong which varies greatly from Thailand. And I conclude that this split from worn out, unimaginative stereotypes concocted in ignorance proves to be a healthy divergence indeed. It's an important life lesson we've gained from the Far East. In the end, we laughed heartily at their impression that all of us “Westerners” look alike, and they giggled just as warmly when we admitted that most Westerners believe all Asians look the same, too. 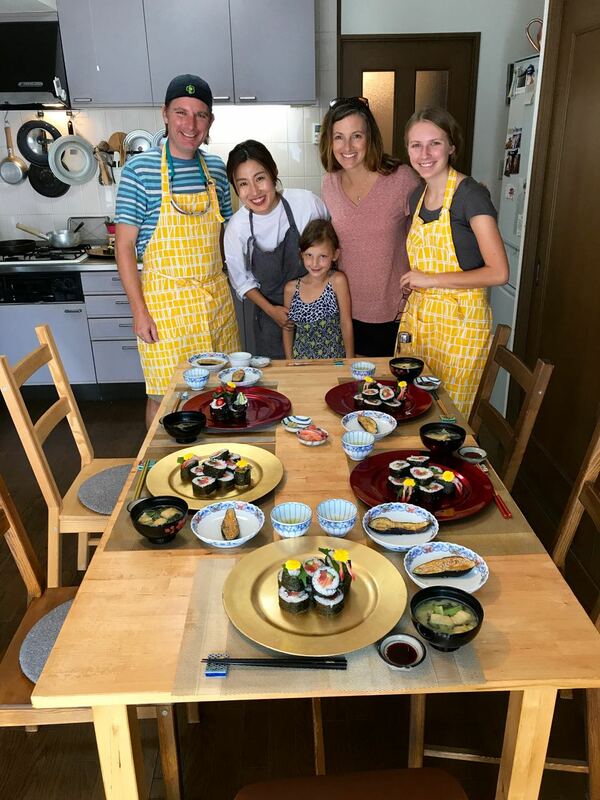 Catherine (not pictured) took this photo of us around Mayuko’s table just after we finished making sushi, fried eggplant, and miso soup together. The next morning, we left Tokyo for Taipei where the louder sing-song tones of Mandarin replaced the quietly crisp vowel sounds of Japanese. In fact, just about everything in Taiwan carried with it a bit more noise: the conversation on the subway trains and in the restaurants, the multitude of scooters zooming by on the streets, the buzzing neon signs hanging low over the sidewalks. With a considerably shorter stay in Taipei, we proceeded as tourists by ascending the (former) tallest building in the world, Taipei 101 (it now ranks 8th), via the (former) fastest elevator in the world (it now classifies as 2nd) for beautiful views of the city and its surrounding mountains. Built to resemble a bamboo stalk, Taipei 101 towers over its neighboring skyscrapers (bottom right) giving expansive views over the city (top right). Autumn stands on a series of mirrors inside Taipei 101’s observation gallery (left). Mitchell sits on his "throne" waiting for his dinner at the Modern Toilet Restaurant. Autumn and Rhonda try to be good sports donning cheesy smiles before consuming their... uh... chocolate ice cream. Modern Toilet Restaurant aside, one of our goals includes sampling local food in each culture we visit. Japan gave us okonomiyaki and sushi; Taiwan gave us xiaolongbao (pronounced “shaow long bouw”). Xiaolongbao (“xiao long” = small basket + “bao" = bun) translates literally as “small basket bun,” and it is basically a thin “bag” of bread filled with delectable little bits of pork and broth. To eat, one first dips a single dumpling in a vinegar/soy/ginger sauce before placing it on a special spoon. Next, one should puncture the dumpling with the end of a chopstick and watch as the tasty broth fills the spoon with deliciousness. Finally, one places a few slices of ginger atop the dumpling and slides the entire thing into the mouth. We loved xiaolongbao so much, we made sure to fill our tummies with it twice at the iconic Din Tai Fung during our short Taipei stay. Handcrafted freshly, xiaolongbao takes an entire assembly team to keep up with demand at Din Tai Fung (top). We ordered ten dumplings per person (see the dumplings in all their glory in their steam basket), and we couldn’t get enough of the delicious dipping sauce (bottom left), as indicated by Autumn’s thorough xiaolongbao enjoyment (bottom right). Our list of Taiwan must-dos also included visiting the old mountain town of Jiufen (complete with a popular street market and amazing views of the East China Sea), and Shifen (which encompasses a railway marketplace and an expansive waterfall). Unfortunately, torrential downpours battered us most of the day, obscuring the views and causing the potential of great bodily harm such as punctured eyeballs at the hands of Chinese tourists armed with umbrellas. Even so, we’re glad to have made the trip to see all of the sites; to have quite the education on Daoist temples and prayer techniques; to have a hike along the Keelung River to see the Shifen waterfalls; and to create and release a lantern in honor of our late niece (Maya) and my late brother (Mike). We asked God to comfort our sister/aunt, Holly, and we prayed for guidance over what's next for us all. On our drive from Taipei to Jiufen, we saw Daoist temples everywhere. Maintained by volunteers, the temples provide a location where a Daoists use “moon blocks" (jiaobei) to make queries of the gods. These two pictures on the streets of Jiufen showing a street sign (right) and a rain-cloaked Autumn (left) portray the only two pictures we took at Jiufen. Our laser beam focus aimed toward the throng of pointy umbrella edges invading our space at every turn, rather on the task of taking photos. Autumn and Eden cross the rope bridge suspended over the Keelung River. Mitchell has the Shifen Falls observation deck all to himself. Many, many "no spitting" signs graced the sidewalks and public spaces in Hong Kong. Add the cacophonous din of the city to the seemingly acceptable behavior of throwing elbows in order to pass through a crowd, and you’ll understand why our favorite Hong Kong locations ended up being quiet areas like the sprawling green space of Kowloon Park and the long, tropical, winding path down from Victoria Peak. Autumn and Eden (if you look closely to the right of Autumn you can see Eden's head peeping above the foliage) run through the hedge maze at Kowloon Park. Eden plays hide and seek with a new friend at Kowloon Park in Hong Kong. We took the Peak Tram up to Victoria Peak, and then we hiked down, down, down via the quiet and winding Old Peak Road. Unfortunately, we spent a good deal of our time in Hong Kong dodging cockroaches and avoiding sticky/dirty spots (and that was just in our apartment) as well as avoiding the constant barrage of “foot massage” adverts being pushed toward Mitchell at every corner. (Yes, they singled out *just* Mitchell. For “foot massages,” if you know what I mean). 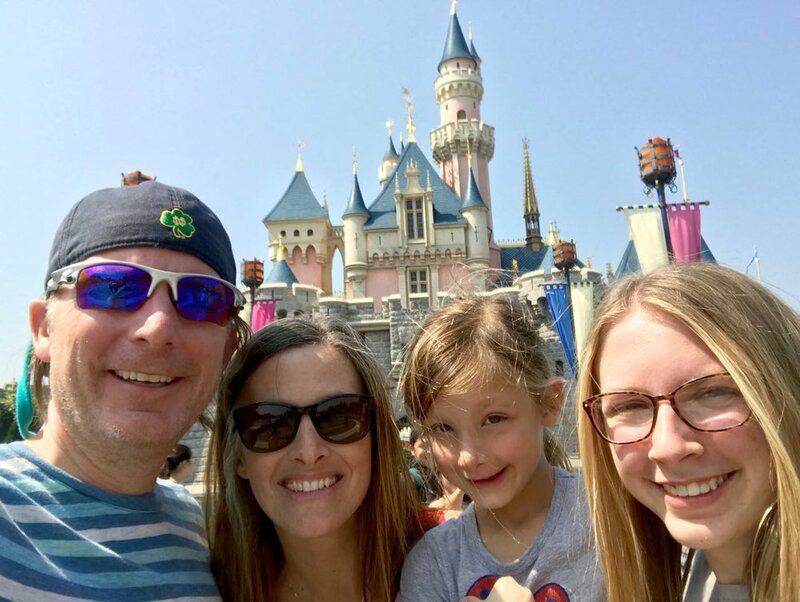 That’s why we surprised the girls with a one-day trip to the (very reasonably priced) Hong Kong Disneyland where queues for rides and shows averaged a mere ten minutes, allowing us to experience every single attraction at least twice. While customer service lacked the typical Disney flare, several rides (Mystic Manor, Hyperspace Mountain, Big Grizzly Mountain Runaway Mine Cars, and RC Racer in Toy Story Land) exceeded our expectations, becoming favorites even over our Disney World experience in Orlando, Florida. Smiling faces in front of Hong Kong Disneyland's Sleeping Beauty Castle. Japan shattered stereotypes of Asian culture we didn't even realize we harbored, and for that, we remain eternally grateful. It's part of the reason I love her so. Unwittingly, however, we subtly revised our broad generalizations only to overlay our newly refined Asian notions upon Taiwan, thus inadvertently expecting Taiwan to resemble Japan... and then later, making the same presumptions of Hong Kong. Finally, we've concluded that Asia sprawls forth as a richly layered, deeply complex tapestry both of cultural beauty and regrettable flaws... just like our native North America... and just like you and like me. Therefore, to slap cultural assumptions on all of Asia, on any of her people groups, or on you or on me for that matter, is simply bad form. It's one (of many) life lessons from the Far East we're grateful to have garnered. Next up, our teachers include Thailand, Cambodia and Singapore; may we be equally open to the lessons they have for us as well. I am fearful, or suspicious, of generalizations... They cannot guide me reliably in making decisions about particular individuals. Watch our travel videos on YouTube by clicking the YouTube button above!